The weird thing is that I would seldom wear shoes given the freedom. From early spring to as late fall as I can manage, you’re most likely to find me wearing either Birkenstocks or Teva’s or I finally bought a pair of Chacos. In spite of this, I still harbor a bit of a fetish for shoes (and jackets…but that’s another blog). Add into this the fact that I’m pretty cheap, and you’ll realize this is a pretty big deal. Holly loves to tell the story of the time I took her to the mall in Kansas. I tried on the shoes I wanted. Stood in the store for awhile. Took them off and thought about it. Left and ran around the mall for awhile working up the gumption to lay down the money for like an hour and half. And finally went back and bought the exact shoes that I looked at when I first got there. So, I have two pair of Merrell’s (dark color and light color) that have been my main classroom shoes for the winter, but I’ve been thinking that standing and teaching in them all day was going to limit their longevity. And even though they’re very comfortable, I find that I have to alternate wearing them different days, otherwise my feet get sore. So, I’ve been sort of shopping for some new casual shoes that could be worn in my classroom that would give good support and not make my feet sore when teaching in them all day. Anyway, the girls and I spent awhile in a shoe store last week. There were some Born, some cool Doc Martens, some Merrell’s and some Tsubo’s that got my attention. The salesman did a great job and I actually felt bad for him when I said that I wasn’t ready to buy anything that day. The Docs were the most comfortable and I could see them really being durable. And even though they were on sale for $80, they weren’t really my favorite color. I might spend $40 or $50 for a pair of shoes that are comfortable and relatively cool even if they’re not in the perfect color that I want, but $80? Yesterday, we stopped at Sam’s and there are a really cool pair Clarks. They look awesome and were on sale for $39. Unfortunately, they just weren’t at comfy as say the Docs or the Merrells so ultimately, they had plenty in my size and I figure I’ve got all week to come back to Sam’s if I decided I could handle the comfort level for the price. Today, we went to the mall to take family pics. (this is another blog, but let me just say this: I have very little patience with posing for pics and suffice to say, I think the girl feels the same way…) With that mission accomplished, the girl was tired and obviously hungry and we decided to eat in the food court. While H was finishing up the transaction at the pic place, I and the girl were walking to the food court when I noticed (in my opinion) the coolest shoe store was having a sale and no shoes were more than $59. So, after we ate, we stopped in. 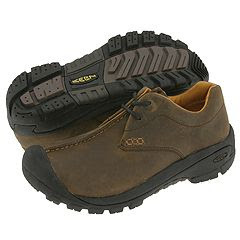 I found the coolest pair of Keen shoes that I’d seen that were in my size, super comfortable and durable, and on sale for $39!!!! Sometimes…once in awhile…it pays off to be a cheapskate.